Hi everyone! For today's article, I will be talking about my list of top 10 uncommons and top 10 commons in this format for P1P1 (pack 1 pick 1). These are some of the most powerful and format-defining cards (since rares and legendaries appear too rarely to really influence the format), so I thought it would be interesting to go over the strengths and weaknesses of each card and explain my ratings. Hopefully, you will also find this useful when drafting! This card is an easy p1p1 over all commons and uncommons, except Changeestik. Honestly though, I did not believe Isomorphic when he told me the same thing at the start of the format. After having played with the card a few times, I'm starting to find it mind-boggling how ridiculously good Veteran Strategist is. 0/4 is a stat-line that would be acceptable on a 2-drop, the influence fixing ability is amazing (even better than a full-on Stranger) and it even triggers Lifeforce! The whole package makes this card amazing in any deck. Moreover, since it is factionless and can go into any deck, it's an even better first pick since you will always end up playing it. This card is an extremely powerful; the ability to give your best living unit lifesteal can often help you to stabilize, while the ability to draw your best dead unit gives you a huge advantage moving forward. One hallmark of the best Spellcraft weapons is that they are amazing regardless of whether you activate the Spellcraft effect. 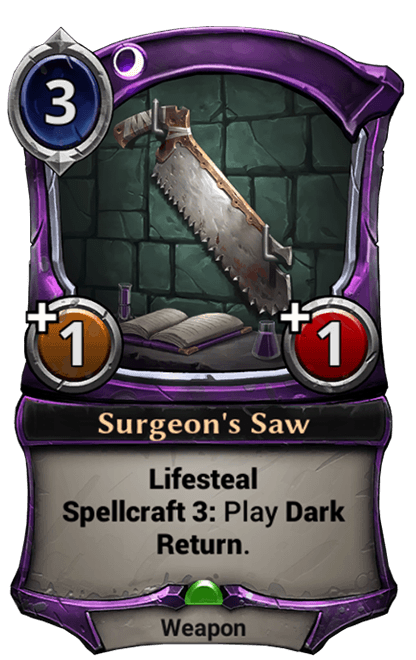 Surgeon's Saw embodies this principle well: A +1/+1 Lifesteal weapon for 3 is great, and 6 power for a +1/+1 Lifesteal weapon and Dark Return is amazing. Moreover, this card gets a few bonus points for being easily splashable. Crownwatch Standard is a card that I was pretty high on once it was spoiled, and playing with it has just made me so much more impressed with the card. Crownwatch Standard is more than just a Finest Hour that cost twice as much because the Lifesteal is extremely significant. Firstly, if you are a slower or more defensive deck, Crownwatch Standard can easily punish your opponent for trying to go wide against your one big unit since the burst lifegain is something that they generally won't account for. Secondly, due to Tribute and powerful tricks being present in the format, a lot of games tend to turn into races. And what better card to win you a race than a giant buff for your biggest unit and gaining a huge chunk of life? Suffocate on a stick is great. 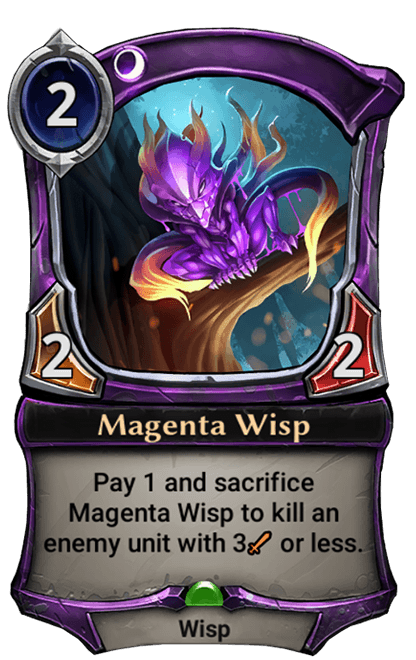 Despite costing 3 times as much as Suffocate itself, Magenta Wisp is still one of the best uncommons. Firstly, the 2/2 for 2 body is nothing to scoff at and you can always play it on turn 2. Being attached to a body also means that you can use Dark Return or Surgeon's Saw to bring it back and Suffocate another unit. Moreover, you can use the sacrifice effect to trigger Tribute. Activating Magenta Wisp on turn 5 to kill something, and then bringing back Magenta Wisp and another Wisp with Soulbringer is backbreaking, as is activating Magenta Wisp on turn 6 and playing a 7/6 for 5 (Pensive Lumen). Perhaps a better description for this section is "Why Flash is Really Bad at Initial Card Evaluations". Lumen Attendant is another card that I definitely underrated. On the surface, a 4 cost 3/3 just does not cut it. However, that is completely the wrong way to think about it. Lumen Attendant is actually a 7 cost 3/3 that comes with a 1/1 and allows you to trade an extra power for the best card in your void. Moreover, you can play it on turn 4 if you are under a lot of pressure! Being able to draw effectively a second copy of your best card is extremely powerful and makes up for the weak stat-line for a 7 drop. Moreover, having 2 bodies is often better than 1 since that gives you more chump fodder and the 1/1 wisp can also activate wisp synergies if you have cards like Mistress of Light and Coronal Umbren. Xenan Lifespeaker is another extremely powerful card for the same reason Crownwatch Standard is so powerful. Giving your units Lifesteal often removes the option of racing from your opponents. Moreover, this card isn't even a bad topdeck late game since you can activate its Ultimate and get a decent body for 5 power. Lastly, being 1 power is also a great upside for an Inspire unit because you want to get it down as soon as possible, and it is also much easier to weave into your plays if you topdeck it later. For example, you can simply go 2 drop+Xenan Lifespeaker on turn 3 at next to no cost, whereas playing Living Example on turn 3 will probably take up your whole turn. Another card that I am guilty of underrating, Shugo Standard has impressed me a lot. Overwhelm helps to push through damage if opponent tries to chump, while +2 health is often enough to blow out bad/greedy blocks by your opponent. Moreover, Fire is one of the three factions with access to Berserk, which essentially doubles the effectiveness of combat tricks. I've lost count of the number of games where I've gone Bloodythirsty Brawler into Shugo Standard to blow out a multi-block and push a ridiculous amount of damage. A 2/5 for 5 flier seems like a poor stat-to-cost ratio and out of place in this top 10 list, but big fliers are a rare commodity in this format. Speardiver is able to bounce or eat all common and uncommon fliers in this format, including the owl from Herald of the Parliament. This makes Speardiver a great card because it completely halts your opponent's aerial assault while also being able to swing into most board states. 2 attack is slightly lackluster, but Berserk mitigates it somewhat, as well as giving you the opportunity for surprise lethal with a huge weapon. If I were to guess the one card that most drafters overrated going into Set 4, Clan Standard would be what I put my money on. Clan Standard is basically a better Lightning Strike, which is already a great removal spell in draft, so it's no surprise that it makes the top 10 uncommons. However, this is a reactive card, and unfortunately, the rest of the set is pretty good at punishing that. Firstly, this card enables tribute for your opponent, which is not great. Secondly, there is a much higher density of fast spells, which increases the risk of your Clan Tactic getting blown out and causing you to take a million to the face. While it works both ways (you can also block first and then blow out a fast spell with Clan Tactic), I think that in a fast spell dense format, getting blown out by fast spells with Clan Tactic is going to be a more common occurrence than the reverse. 3/4 for 4 is a decent starting point, but the Killer ability when Tributed is what really sells this card. Having a 3/4 stat-line means that this card can simply eat most fliers in this format and live. Even if you simply use this to Killer a 3-drop, that can help you to out tempo your opponents. The main issue with this card is that you often can't reliably trigger it's Tribute, and the fail case of vanilla 3/4 for 4 is not amazing. Even someone who has never played this format can easily tell you that Changeestik is busted. Giving your best threat evasion while effectively removing your opponent's best threat can often win you the game on the spot. This card is ridiculously powerful, and probably the correct pick in 90% of packs. I would say though, that people tend to overreact to this sort of card and will instantly rate it as OP. This is the type of card that can catapult you ahead from even or behind, and just outright wins you the game if you are ahead. As such, it's a very feelsbad card and often gets the bulk of the blame for a loss, even if you were already behind to begin with. In terms of power level, I think this is at most on-par with Archive Curator, if not slightly weaker than it. However, Archive Curator gets much less hate because it's not as flashy; i.e. it's not a card that "wins" you the game, it's just a card that prevents your opponent from winning the game. A 3/2 weapon for 4 is pretty great, especially in a faction with Beserk units, and 3/2 weapon + Torch for 7 is amazing. As I've said previously, the hallmark of a good Spellcraft weapon is that both of it's modes are great, and this is definitely true for Welding Torch. In general, Spellcraft weapons are a lot better than they look because even if 3/2 weapon + Torch for 7 seems ridiculously expensive, you must realize that you are also using one less card. So effectively, it's a 3/2 weapon, Torch, and a Wisdom of the Elders. If you were to think of it that way, it suddenly seems to be a lot more powerful. Card advantage is a huge thing in draft, and Spellcraft weapons create that advantage every time you activate them. This is definitely another card that flew under the radar initially. People called it the poor man's Crownwatch Cavalry, and while that is true, it turns out that 3 is a lottttttttttttttt less than 4. Curving turn 2 Hotblood Barbarian into turn 3 Master-at-Arms and smacking your opponent for 8 damage on turn 3 is no joke. This card is a great turn 3 play to follow up your 2-drop, but even in the late game, giving your biggest unit or flier +2/+2 is not insignificant and can often swing races into your favor or force awkward blocks by your opponent. The one downside to Master-at-Arms is that it makes your attacks very vulnerable to fast speed removal since the buff disappears once Master-at-Arms dies, so opponents can easily get a 2-for-1 by removing Master-at-Arms after you declare attacks and then eat your shrunken attacker. This is probably one of the strongest inspire units in the set. Giving +1/+1 to all units you draw is amazing, and being able to play this early means that you are often able to get a good amount of value out of the inspire text relative to more expensive inspire units like Alhed and Cliffside Caretaker. The main drawback of this card is that 1 health is pretty fragile and not being able to block with it isn't great. A big ball of stats is always great, and while a 5/4 for 5 is a pretty reasonable starting point, a 7/6 for 5 is downright disgusting. Creatures are also generally smaller in this format, so you will often get 2/3-for-1 with your Pensive Lumens. This becomes even more of a beating if you are able to weapon it up or give it evasion (Changeestik). I'm sure a lot of people would be surprised to see Corrupted Umbren so low on the list since everyone would have that one game where they curve Corrupted Umbren into Lethrai Bladewhirl and Berserk for 12 damage, or blow out a double block on Corrupted Umbren with Rapid Shot while simultaneously pushing 7 damage. However, the main issue that Corrupted Umbren is so low on my list (Number 4~6 is low LOL) is that if you don't have enablers, this card only has a mediocre stat-line of 3/4 with Lifesteal. As such, this low fail case makes me put it below the other top commons. I feel like Learned Herbalist just opens up so much potential for your deck because it activates spells matter cards, triggers Lifeforce AND provides fixing for splashes. This makes Learned Herbalist a great early pick since it allows you to pick payoffs (Wurmstone, Katra, and Changeestik respectively) a lot more freely. Moreover, even if you end up in straight 2 faction decks, Learned Herbalist can also help to bail you out of influence screw. The ramp potential of Secret Pages is also not to be underestimated. Going turn 2 Learned Herbalist, turn 3 Secret Pages, turn 4 Pensive Lumen is a scary curve for sure. Eating up the whole of turn 3 is definitely a downside, but I don't think it's a huge deal in the current format, especially since dropping a huge 5 drop just removes whatever tempo your opponent had gained. This card is extremely powerful, since playing it often generates two threats for your opponent to deal with. His buff synergizes very well with fliers and Quickdraw units, and can often win races for you. Even on the defense, you can make two threatening units for the price of one and deny your opponent any good attacks. There is also a cute synergy between this card and the 4th best Shadow common, Lethrai Target Caller, since a 5/2 Quickdraw is extremely scary, and placing the buff on a Quickdraw unit is great too! Out of all the cards in my current top 10 list, Cut Ties is definitely the most surprising one for me. Given that Inspire Obedience was an extremely lowly rated common in the previous 2 sets, I was expecting to say the same for Cut Ties. However, there are 3 key differences that makes Cut Ties a much stronger pick. Firstly, 6 is A LOT less than 7 and coupling that with the slower format makes me much more willing to pick and play it. Secondly, requiring only a single S rather than SS makes this card much easier to splash. Lastly, being fast is also another big advantage. Even though in most cases, you would want to Cut Ties on your turn to avoid enabling Tribute, there are often situations where you want to use Cut Ties as a trick (e.g. to blow out an opposing trick or to bait your opponent into an aggressive A+Space). The combination of these 3 factors is what pushed a mediocre common in the previous sets into one of the top spots in this format. Illumination Wisp barely slips into the top 10 and may be another surprising inclusion to most people. Similar to Learned Herbalist, there isn't one single imbalanced aspect to Illumination Wisp that you can point to, but rather the whole host of random things that it is able to do/enable. Firstly, a simple 1/3 flier is a great starting point, being able to hold weapons well and block or trade with a lot of the common fliers in the format (Advance Scout, Rotorcycle, Skysnapper, etc.). Secondly, Endurance makes it an even better weapons holder since it's able to both attack and defend. There is also a minor Endurance matters' theme in Combrei that this wisp enables. Going turn 2 Illumination Wisp into turn 3 Longhorn Treasurer is a scary curve indeed. Lastly, the Wisp type is somewhat relevant in this format, with a decent amount of tribal support (Preserver of Dualities, Mistress of Light, etc) . It's interesting to note that Time occupies a huge chunk of the top commons (4/10) and this squares up well with the general consensus that Time is one of the deepest factions in draft currently. In contrast, despite dominating the top uncommons (3/10) and having the second most top commons (3/10), I'm not actually convinced that Shadow is that deep. I suspect that this is because the power level of Shadow commons just fall of a cliff after Lethrai Target Caller (4th best Shadow common), and also weaker Shadow cards available in the curated packs. That said, I do think that the factions are extremely close in power levels, and any statements above are really just focusing on minute differences. In my opinion, the best strategy in draft is still to try and stay open and simply move into the factions that are open; being in the correct factions will generally overshadow any differences between factions. What are your thoughts on the top 10 lists? Do you have any strong disagreements? As always, let me know your thoughts on the Reddit thread!